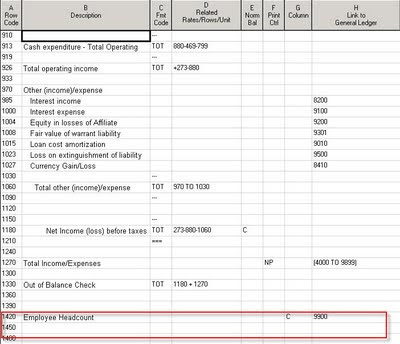 Placing the column in which you want the headcount to appear in the 'G' Column of the report Row Format tells FRx that you want that data to appear only in that column. If you want the data to appear in multiple columns, enter those columns separated by commas, i.e., C, G, J. Nice Tip! Is it possible to report the average headcount at quarterly and YTD intervals representing the elapsed time so far in that interval?